The October Visa Bulletin has been released by the Department of State. Every single Family-Based category will advance at least 1 week, with most categories advancing between two weeks and one month. Employment-Based categories made significant advancements, except for India (all categories) and China EB-3. 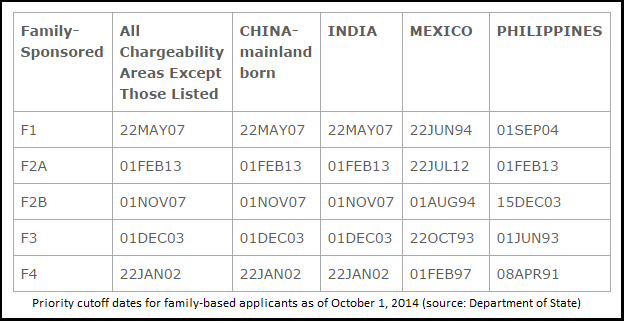 Additional details, plus the complete visa bulletin charts, are below. 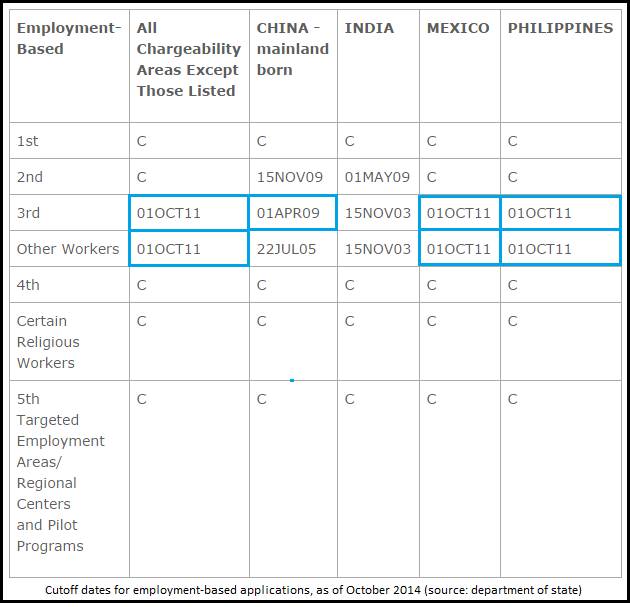 INDIA Employment-based Second Preference: The use of potentially “otherwise unused” Employment numbers prescribed by Section 202(a)(5) of the Immigration and Nationality Act (INA) has allowed the India Employment Second preference cut-off date to advance very rapidly in recent months. Continued forward movement of this cut-off date during the upcoming months cannot be guaranteed, however, and no assumptions should be made until the dates are formally announced. Once there is a significant increase in India Employment Second preference demand it will be necessary to retrogress the cut-off date, possibly as early as November, to hold number use within the fiscal year 2015 annual limit.